We do not catch disease, we manufacture it. Our body was meant to eliminate toxins and impurities through the colon. If we are constipated and do not have a bowel movement for every meal eaten, we are allowing the colon to back up and toxify our system. 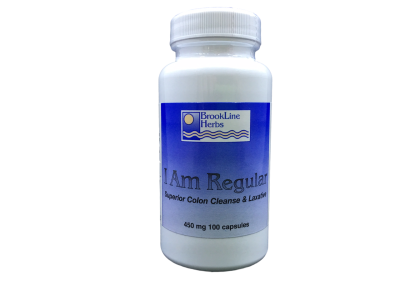 I Am Regular cleans the colon and flushes toxins. Over time, as the channels in the colon become open and cleansed, you will become less bloated, more alert, more energetic, lighter, and you will not have that hard to describe yucky feeling. Your skin will radiate a glow of health. This formula is self-regulated. You must decide on a dose that is right for you. Start with one capsule per day and increase the dosage by one capsule per day, until you are getting one bowel movement per meal eaten. You can take these in the morning or evening, or both morning and evenings. See what works best for you. Don't take more than 3-4 per day unless consulting with a physician. catch disease, we manufacture it. Our body was meant to eliminate toxins and impurities through the colon. If we are constipated and do not have a bowel movement for every meal eaten, we are allowing the colon to back up and toxify our system. I Am Regular cleans the colon and flushes toxins. Over time, as the channels in the colon become open and cleansed, you will become less bloated, more alert, more energetic, lighter, and you will not have that hard to describe yucky feeling. Your skin will radiate a glow of health. Ingredients:aloes: relieves constipationbarberry root bark: astringentcascara sagrada bark: tones and strengthens bowel, effect normal functionpsyllium seed: provides bulk, lubricatesrhubarb root: highly esteemed laxative tonic, removes irritating substance in bowels, tones tissuesenna pod: increases peristaltic movement, catharticslippery elm bark: soothes, speeds up healing Adult Dosage:This formula is self-regulated. You must decide on a dose that is right for you. Start with one capsule per day and increase the dosage by one capsule per day, until you are getting one bowel movement per meal eaten. You can take these in the morning or evening, or both morning and evenings. See what works best for you. Don't take more than 3-4 per day unless consulting with a physician. A traditional combination of natural herbs that have been long used for kidney stones. This formula can help dissolve kidney stones and relieve the pain associated with passing them. Two capsules, twice a day. Note: Drink lots of water with this formula, at least eight glasses a day. Another way to calculate the amount of water needed by the body daily, is one ounce of water per one pound of body weight. So if you weight 128 lbs. you should drink 128 ounces or one gallon of water.